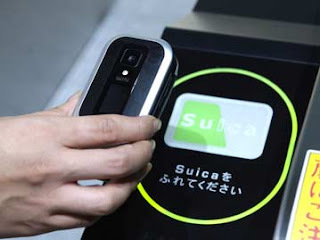 Smartcard News Blog: Does NFC ring any bells? Does NFC ring any bells? Once again Cartes has come and gone, no rail strike and perfect weather. In a way it seems to reflect the industry as a whole. The technology is hidden away and now we are only presented with the business propositions, the icing on the cake. Not a complaint just a realisation that the industry is now truly mature. It’s funny really but when you are following the technology everybody is busy telling you that it’s all going to happen next year and of course it never does. When people stop evangelising then suddenly it’s all done and dusted.So are there any loose ends? Well you wouldn’t want to be disappointed would you? Does NFC ring any bells? Now here’s the interesting thing the evangelists have gone, no more ramming it down your throat, a sort of acceptance that it will probably happen but no time real soon and that there probably isn’t a killer application. It’s all a matter of an instrument that gives you a better way of life. In other words the phones will eventually have NFC and people will find things to do with it. Now it’s taken a little time but I’ve got there, the phone is an instrument of social networking, either to talk, text or email and just about everything else pails into insignificance. Most phones have Bluetooth but it’s not really a part of everyday life, I suspect most people never use it. The camera, oh yes that’s a biggy because it fits into our social networking by providing a means of sharing experiences. Don’t laugh even I take pictures on my mobile phone, in fact I was persuaded by my other half to upgrade my phone just to improve the camera. It takes a little longer but on a good day I can even get the pictures off the phone and onto the PC. So here’s the question does NFC help with my social networking? Payments – no, mass transit – no, security – no, information – no, connecting with my network - ? Now we’ve got to the Achilles’ heal, does NFC help me communicate? By definition NFC, remember Near Field Communications, and according to he who knows about these things that means magnetic fields operating over a few centimetres or to use the buzz words Person to Person (P2P) but almost with physical contact. So what does NFC allow me to do that I can’t physically do given that the other person is standing next to me? And before some bright spark emails me it’s not about shaking hands with the Queen without touching her. Let’s be more practical, I can pass data stored in my phone to the phone of the other person. But I can do that today with Bluetooth and most people don’t bother they usually send a text or an email. Smart phone users send emails and everybody else sends text messages, well that’s my observation anyway. Ah ha they tell me but look how much easier it will be to do this with NFC, there’s no pairing required which you need to do with Bluetooth when two devices first meet. The trouble is you are still going to have to set up the application that uses NFC so I can imagine people will still use text or email. But it’s free, there are no network costs to communicate by NFC, I don’t think anybody cares. Those with smart phones will already have a data contract and those with text messaging just seem to see that as a part of life. Now let’s not give up, the Apple iPhone has a huge cult following of which a big part is the world of iPhone applications. Can you imagine developers producing applications that use NFC? That’s assuming Apple decide to include NFC of course but I’m told by insiders they are seriously considering their options. But I’m stuck again, what could you do with NFC that you can’t do with Wi-Fi or Bluetooth? In fact those few centimetres seem to be a problem unless I want to make sure nobody can over hear me, now what thought does that put in your mind? We seem to say it so often but if you don’t need security don’t use smart cards, that has been our mission statement for years. NFC is based around a secure element, the SIM card or some other chip. Nobody has shown me an application for NFC other than payments that needs security and everybody now tells me that payments are not a major driver – so where do we go next?